Buying all the ingredients for a traditional Christmas dinner and making sure you have enough without lots going to waste is a bit of an art form. We have made a list of all the Christmas food items that we have on offer, we hope this list may be helpful when planning your special festive meal. If you would like us to help you through your shopping list the team at Wysipig will be only too pleased to help, we can advise you on how much you will need to feed all the family, cooking tips and just about anything to help the big day go with a swing. If there is anything in particular you would like us to get in for you don't be afraid to ask! You can communicate with us by telephone, email or come up to the farm shop and will receive a warm welcome, it is a bit of a trek up our long track but the journey is well worth it. Turkeys - Bronze and white, free range or barn reared, we can also do crowns. Home Cured Gammons - Green or smoked, on the bone or boned and rolled. Kevin's and wonderful sage and onion with chestnut variety. Bacon - Back, streaky, green or smoked. Beef - 21 day matured, all cuts available. Vegetables - Large selection of traditional essentials. Bread - Freshly baked by 'Warings' for us, why not try the delicious mince pies. Homade Pickles - Pickles, pickled onions, preserves and of course cranberry sauce! Eggs - Free range chicken and duck eggs. Logs - Don't forget we also deliver logs for the fire by bag or load. Well we had a great taster day on Saturday, lots of visitors and orders. Don't worry if you didn't make it there's plenty of time to decide what you need for Christmas. Just email or call us and we'll do all the rest, don't forget friendly help and advice is only one call away! The Christmas has arrived at ‘Wysipig’ in Arborfield, the farm will have lots of great things on offer at its monthly open day this Saturday 8th November from 10am to 4pm. Why not come and join us and get into that Christmas spirit. Customers will be able to try samples and discuss Christmas orders for turkeys, gammons, sausages from the great range of meat and other products. The farm shop is packed with Christmas goodies and visitors can place their orders to be collected or take advantage of the free delivery service. For Christmas the farm has a great gift shop in the barn, come along and have a browse, there is a wide range of suitable presents for all the family as well as lots of other interesting bits and pieces. 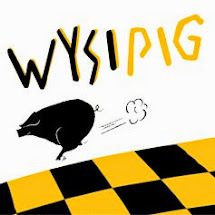 As usual there will be ‘Wysipig Breakfast Baps’, hog roast rolls for lunch, teas and cakes. The team will be on hand to help with advice on ordering and cooking tips, they look forward to meeting you.